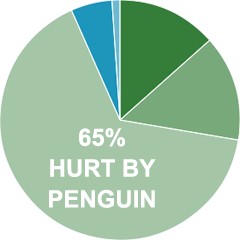 About a month ago, we polled our readers asking how they were impacted by the Google Penguin update. We have well over a 1,000 responses and I wanted to share them with you. Keep in mind, those who were negatively impacted are probably more likely to take the poll. That being said, 65% said they were negatively impacted by Penguin, while only 13% said they were positively impacted. This is way more than the Panda update where only 40% said they were negatively impacted by the Panda update. Again, it depends who takes the poll but huge differences. Note, Panda was a larger update and should have been felt by more sites on the web. But Penguin was likely targeting specific SEO techniques, because it was originally named the over optimization penalty. Forum discussion continued at Google+, WebmasterWorld, DigitalPoint Forums, Cre8asite Forums and Google Webmaster Help.